Home / Body / Belly Fat in Women: What Causes it and How Can You Trim It? The visible effects of aging on the skin (fine lines, wrinkles, and sunspots) are not the only ones that worry most women. Body shape changes are a big concern too, as an expanding waistline or midsection tends to be common as we get older. Key life transitions like menopause also play a part, as it results in a decline in estrogen that causes the fat to shift in the abdomen. This is also the reason why most women gain weight during the menopausal transition. The level of activity also slows down with age, contributing to an increase in stored fat. The sad truth about belly fat is that it does more than make it hard for you to fit into your old pants or clothes. Carrying an excess weight in your midsection also increases your risk of certain health conditions. Fortunately, making an effort to reduce this fat also reduces your risk. Consuming more calories than what you burn (eating too much and working out too little) usually leads to an excess weight, which includes an expanding waistline. Aging also plays a role, as fat usually increases with age, along with a decrease in muscle mass and function. The decreasing levels of estrogen contribute to the development of belly fat in many women. The sad part is, this can happen even if there is an absence of weight gain. This is usually exacerbated with high-calorie intake and lower activity levels. There is also a genetic component in your tendency to carry or gain weight around the midsection. According to an article in Harvard Health, the genetic influence to be overweight varies from person to person. It can be as low as 25% and as high as 70% to 80%. 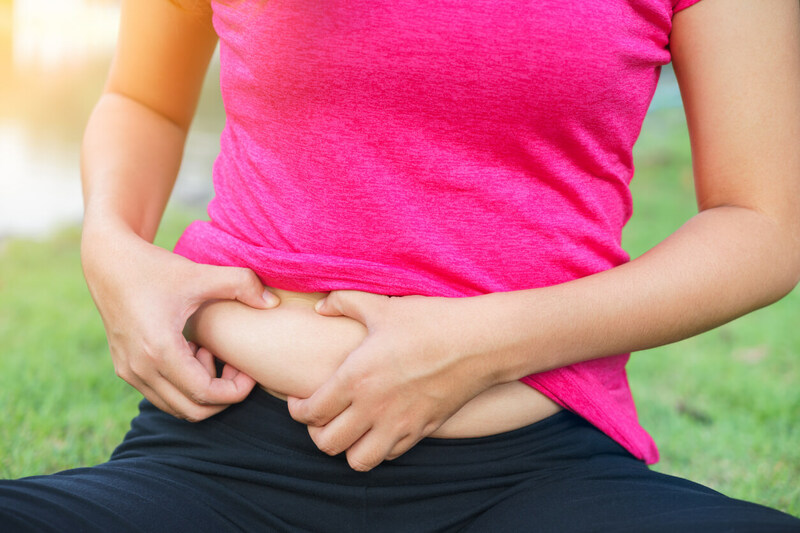 It is also mentioned in our previous blog post, All About Stubborn Fat, that belly fat has a higher density of alpha-2 receptors, which slows fat burning. These receptors are the “bad guys” when it comes to losing stubborn fat. What can you do to trim the fat? It all starts with a healthy diet and regular exercise. Load up on fruits and vegetables and choose low-fat dairy products and lean sources of protein. Be sure to limit the amount of saturated fat (butter, red meat, whole milk dairy products), and eat moderate amount of polyunsaturated and monounsaturated fat (fish, seeds, and nuts). Exercise also plays a big role, especially those that can help tone up your abdominal muscles like crunches. Do take note, however, that they are not enough in getting rid of abdominal fat. Positive lifestyle changes, along with non-invasive fat reduction procedures, are beneficial. Avoid sugary beverages. These include soft drinks, fruit juice drinks, and other beverages with artificial sweetener. Replace these drinks with water or unsweetened tea. One exceptionally good choice is green tea. Do some strength training. This is beneficial in building muscles, which can then replace the fat. The best part is strength training can help increase the amount of calories you burn, even after you’ve finished exercising. Load up on fiber. These include beans and legumes, whole grain, fruits, and vegetables (particularly those in darker color). Fiber, especially soluble ones, promotes weight loss by making you feel full. They may also help fight belly fat. This FDA-cleared device uses contactless radiofrequency (RF) energy to melt and kill only fat cells. Vanquish can reduce the circumference of your entire abdominal area with an unmatched level of safety and comfort. It is also ideal for losing inches off your arms, waistline, thighs, and flanks. The fat cells exposure to RF energy triggers apoptosis, causing them to die naturally over time. They will then be processed as waste in the liver and cleared naturally through the lymphatic system. The best part about Vanquish is that it can shape your body without any skin contact, as the device just hovers over the area of concern using a panel array of heat. Check out our previous blog to learn more about this contactless, non-invasive fat removal treatment. Cryolipolysis is a fat freezing procedure that uses a controlled cooling technology to specifically target fat cells without harming the skin and other tissues. At Cutis Laser Clinics in Singapore, we offer two devices that use Cryolipolysis: CoolSculpting and Z Lipo. CoolSculpting (from Zeltiq) is an FDA-approved device made in the United States. It features a number of applicators to target fats in different parts of the body. These include the belly, thighs, arms, and chin. It can also treat smaller fats like bra and knee fat. Z Lipo (by Zimmer) is fat reduction device made in Germany. It also features a number of handpieces in different sizes that can treat fat bulges in the arms, belly, and thighs. It’s built in with two applicators attached to its device and can be used in a single treatment. This reduces the overall duration of the procedure. If you want to learn more about the difference between CoolSculpting and Z Lipo Fat freezing, read our previous blog. Don’t let belly fat wear you down. Contact Cutis Laser Clinics today and schedule a body assessment and consultation with our Harvard-trained aesthetic doctor, Dr. Sylvia Ramirez, to find out which procedure is suitable for you.